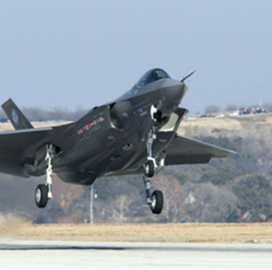 Lockheed Martin (NYSE: LMT) is in talks with the U.S. and 10 other countries over a potential contract worth at least $37 billion for the manufacturer to deliver a total of 440 F-35 fighter aircraft, Reuters reported Sunday. Sources told Reuters the multi-year transaction will consist of three portions from fiscal 2018 to fiscal 2020 with a plan to buy at least 135 fighter jets in fiscal 2018 for approximately $88 million per unit. Customer nations are expected to increase their purchase to up to 150 F-35s in the following fiscal years at an average price of $85 million per jet in fiscal 2019 and less than $80 million per unit in fiscal 2020, according to the people familiar with the negotiations. One of the sources said revised estimates show the Defense Department expects to allocate $379 billion in funds to build and procure 2,443 F-35s until 2039. Reuters reported that representatives from the U.S., U.K., Australia, Italy, Denmark, Japan, Israel, South Korea, Norway, Turkey and the Netherlands discussed the terms during a meeting in Baltimore, Maryland, and visited a Northrop Grumman-run (NYSE: NOC) facility that supplies F-35 equipment. Talks over the potential deal came four months after Lockheed and DoD finalized an $8.5 billion contract for the production of 90 lot 10 F-35s. Tags Australia Defense Department denmark DOD F-35 featured fighter jet govcon Israel italy Japan lmt Lockheed Martin netherlands noc Northrop Grumman norway South Korea Turkey u.k.